In our family, someone is always reading a book. Sometimes we’re enjoying great literature. Other times we’re reading individually, learning how to master a new skill. Or we may just enjoy stories of faraway places or times. And as our family lives off the grid in Canada’s Northwest Territories where we homestead and homeschool, we depend on books to get us through the long dark winters. One of our family’s favorite holiday traditions is curling up by our wood stove for a family read-aloud about Christmas in “the olden days”. (We also enjoy pioneer Christmas craft activities – scroll down to the end of this post for more information.) Ever since I read the Little House on the Prairies series as a child myself many years ago, I’ve been fascinated by pioneer times. Now my children are too. Here are a few of our family favourite pioneer Christmas books for kids to help you get started, plus a couple that we’re planning to add to our collection. And take note – many of these tales of Christmas in pioneer times make great additions to homeschool pioneer unit studies. First published back in 2003, this beautifully illustrated picture book describes one family’s Christmas in the backwoods of Canada in 1841. As part of a series by Barbara Greenwood (other titles include A Pioneer Sampler and A Pioneer Thanksgiving), this book includes stories, crafts, and interesting facts about how the pioneers celebrated Christmas. Although we read it “for fun”, it’s also a good choice for homeschooling families working on Christmas units. My (now grown) sons loved this book when they were small. Set in 1881, it’s the story of the Ansterberg family, and how they dealt with an unexpected challenge right before Christmas. The gentle language and pretty pictures capture the attention of young children. And the message of family, faith, and the Christmas spirit resonate with older ones. The recommended ages are 4 – 8, but I still love this book and I’m a little past that! Another of the beautifully illustrated pioneer Christmas books for children, the story of widower and woodcarver Jonathan Toomey has a more serious tone than some of the other seasonal children’s books we’ve enjoyed. Yet it’s beautifully written, and a reminder of the joy that can follow sorrow. And take note – this book has a lot of text on each page, so your older kids (aged 7+) may like it more than your preschoolers and kindergarten gang. In 1840 Salem, North Carolina, the Moravian community is enjoying their own special Christmas customs, including the Christmas Lovefeast Celebrations. The Moravians were a small German Protestant sect who emigrated to the United States in the mid-1800s. 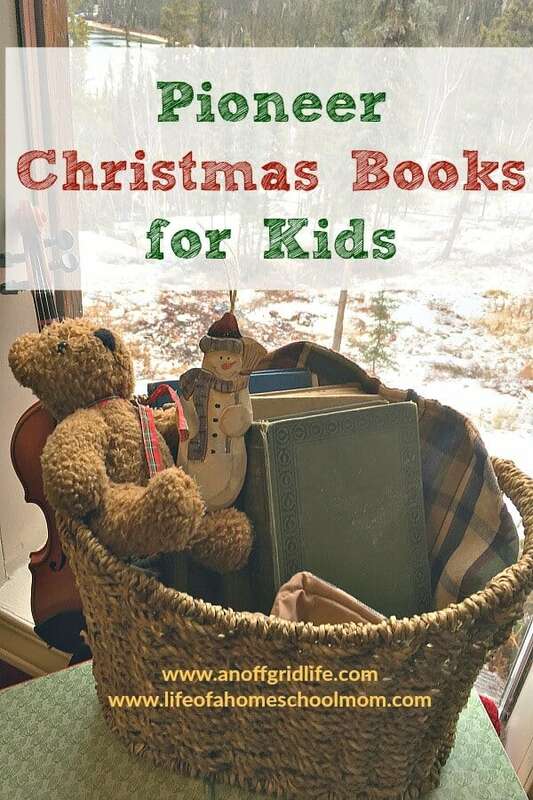 This award-winning picture book aimed at children in the 4 to 8 range, could easily be used as part of a homeschool unit on Christian Christmas celebrations. Cozy homes warmed by wood stoves, handmade Christmas gifts, and a special pageant — this delightful children’s holiday book is a warm, cozy read for a cold winter night. Set in the late 1800s’ New England, it gives readers a glimpse of what Christmas was like for a little girl in simpler times. Introduce your littlest ones to what may be the most well-loved pioneer Christmas books for kids around with the Little House Picture Book Series. Read them aloud to your preschoolers or have your new readers try them on their own. This book shares the story of Laura Ingalls’ family Christmas in Wisconsin, with her mother Caroline’s extended family, and has been one of our family favourites for over 20 years. Another Christmas book for children by Laura Ingalls Wilder that every family should enjoy! This treasury includes five stories of the Ingalls’ family Christmas’ on the American frontier. It’s illustrated by Garth Williams, who also illustrated the original Little House on the Prairie books. Who hasn’t heard the beloved holiday story rhyme of The Night Before Christmas? Learn the story of how Clement Clark Moore created the tale for his children back in 1882. And then share the original poem as well – it’s part of the book too. Many of North America’s pioneers were immigrants who struggled to adapt to live in a new country while cherishing traditions and values from their home country. Irene Morck’s collection of Christmas stories are based on her Danish father’s childhood on an American prairie homestead in the late 1800s and can be enjoyed by the whole family. Another great option for homeschooling families looking for pioneer Christmas books for kids that have an educational component. Young Melissa is told she can bring one favorite item along on when her family travels the Oregon Trail to move out west. She chooses a beautiful, but extremely delicate, porcelain angel to adorn the family Christmas tree. This picture book also includes a map, typical supply list, list of links to Oregon Trail websites plus five free printables for your homeschool. Consider adding one or more of these books to your family holiday book collection annually, and introduce a family holiday read-aloud tradition today. Do you love all learning about pioneer times as much as we do? If so, visit my site and grab your Pioneer Christmas Crafts For Kids freebie! What are your favorite pioneer Christmas books for kids? Sarita is a homeschooling work-at-home mom learning how to homestead off the grid in Canada’s far north. She shares her family’s tips, tools, and tales of living off the grid in a cold climate at Off Grid Life. Follow her on Facebook, Pinterest, and Instagram.